Our menu and recipes change from time to time. 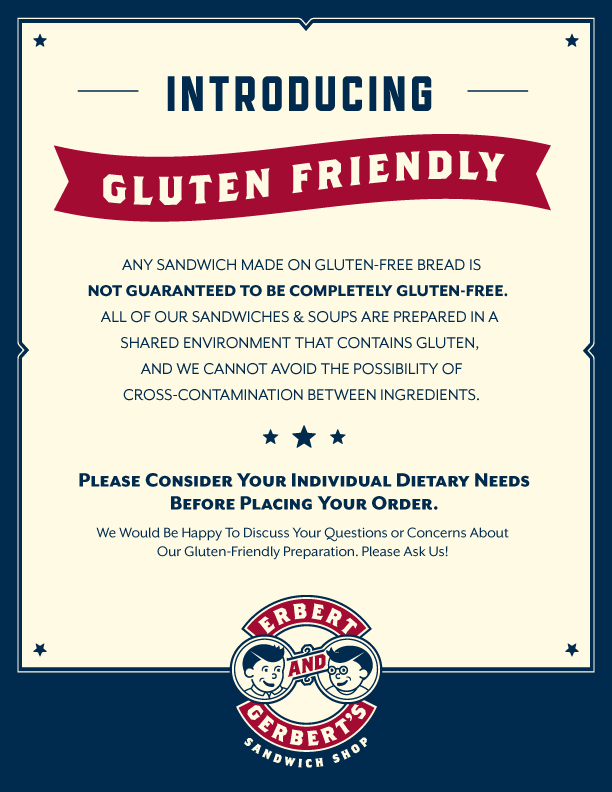 If you have an allergy concern, please ask a manager at your location to check the ingredient listing for specific menu items or visit ErbertAndGerberts.com for details. Our stores contain gluten and while steps have been taken to prevent cross-contamination, please note that we cannot guarantee that any of our menu items are free of allergens because we use shared equipment and handle common allergens throughout our supply chain and sandwich shop. ** Please note that as of 11/10/2017 our Chicken Wild Rice Soup is temporarily not gluten-friendly due to a product shortage. We are expecting a new shipment shortly. We have several products that contain peanuts/tree nuts or have been manufactured on equipment that also processes products containing peanut/tree nuts. Please consider your dietary restrictions when consuming these products or entering one of our sandwich shops, as some of these allergens may be airborne. Please order with caution and let a staff member know if someone in your party has a food allergy.